We are the leading provider of plotter cut films and digitally printable media used for heat transfers on clothing. McLogan has the best selection of heat transfer films on the market, offering over 20 different product lines that encompass a vast selection of colors and patterns to fit every type of apparel decoration need. Regardless of what type of garment you are embellishing, we have a heat transfer film well suited for the task and we are proud to offer the most dependable products on the market. This is our #1 selling product in the nation. ThermoFlex Plus is available in 43 colors with a matte finish, 6 colors with a glossy finish and 6 metal flake colors to match all your popular sports teams. Most colors of ThermoFlex® Plus may be applied in layers for multi-colored designs, with the exception of the Neon colors, Antique Silver, Old Gold, Metal Flake colors and Columbia Blue. ThermoFlex Glitter Flex Ultra has the widest color selection on the market: 30 amazing colors to be exact. This glitter product has an easy-to-use sticky carrier, which makes weeding a snap. It has actual glitter flakes encased in a high quality heat sealing adhesive. As GlitterFlex™ Ultra films are thicker than most of our other films, simply increase the downward pressure of your knife blade in order to ensure clean cuts and easy weeding. Please note: the Holo Pink (GF-Ultra 13) has limited opacity when pressing onto dark garments, so for best results please test the effect before doing a large run. No nylon, dazzle cloth, shiny polyester or moisture-wicking materials. ThermoFlex® Plus Glossy – Compare the ease of weeding and applying ThermoFlex® Plus Glossy with competitive products and discover why so many professionals ask for it by name. 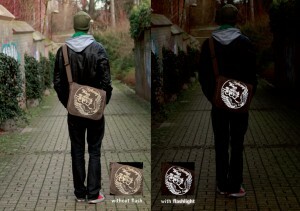 This heat transfer vinyl is a durable polyurethane based material that is highly flexible. It has a soft hand and strong grip and if applied properly will outlast the life of the garment. 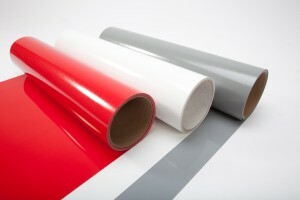 ThermoFlex Plus Glossy is available in 6 colors with a glossy finish colors to match all your popular sports teams. ThermoFlex® PLUS Glossy will NOT adhere to nylon, dazzle cloth, or shiny polyester. This heat transfer material is available in 23 different patterns and 17 solid colors, including neon and a frosty clear(Sensation Opaque Translucent). No matter how dark the color is in natural light, the entire design lights up bright white when hit with the flash of a camera, flashlight, or headlights. Click the link to read our blog about ThermoFlex Reflectra. ThermoFlex® Stretch is a durable polyurethane based material that is highly flexible. 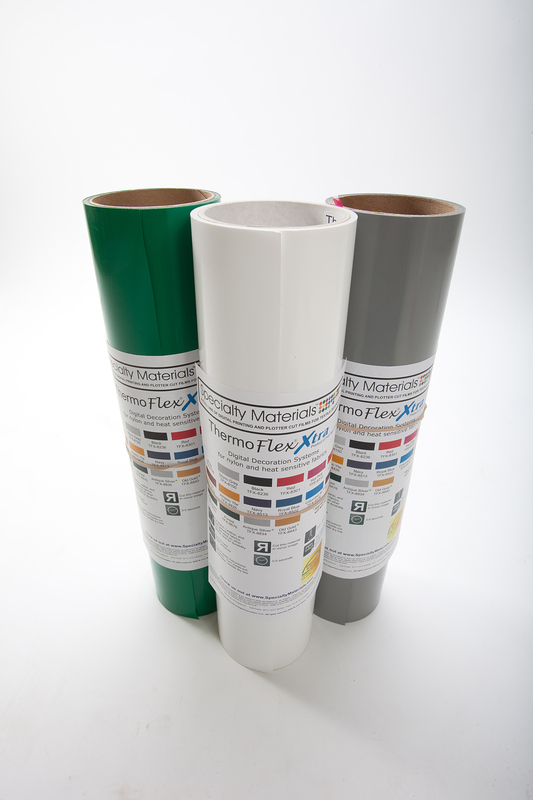 It offers the same soft-hand matte finish as the Thermoflex® PLUS, but has the capacity for high stretch and rebound! Great for stretchy clothing! ThermoFlex® Stretch is available in 6 colors with a matte finish: white stretch, green stretch, red stretch, black stretch, royal blue stretch and athletic gold stretch. ThermoFlex® Sport is a durable thick film material designed to bridge the gaps in open-mesh athletic jersey. You can heat press ThermoFlex® Sport at a relatively low (300° F – 320° F) temperature and short dwell time (8-10 seconds), which minimizes dye migration from colored polyester jersey mesh. You can transfer ThermoFlex® Sport to nylon jersey well using the lowest temperature (300° F) and the shortest dwell time (8 seconds). ThermoFlex® Sport is available in seven (7) standard team colors: White, Athletic Yellow, Red, Royal Blue, Navy Blue, Kelly Green and Black. Thermoflex Xtra – The new ThermoFlex® Xtra has incorporated the desirable features of our popular ThermoFlex® Plus including easier handling, cutting and weeding from the addition of its thicker polyester carrier sheet and low-tack carrier adhesive that enables easy weeding without lifting the cut image from its carrier. In addition to nylon and leather, ThermoFlex® Xtra will adhere to siliconized materials with sufficient surface texture for the adhesive to grip, when transferred according to directions. ThermoFlex® Xtra is available in sixteen (16) different colors including: White, Storm Grey, Black, Pink, Orange, Athletic Yellow, Navy Blue, Royal Blue, Columbia Blue, Kelly Green, Forest Green, Maroon, Royal Purple, Antique Silver and Old Gold. 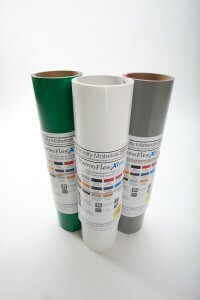 Order your next roll of ThermoFlex online at Mclogan.com or call one of our 4 locations to speak to a representative.